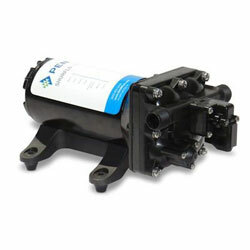 Flow Rate: 4.0 GPM, 45 PSI Max., Port Size: 1/2"
SHURflo Pro Baitmaster II Heavy Duty Livewell Pumps are designed for the toughest marine washdown and livewell applications. Designed for livewell tanks up to 35 Gal. SHURflo Livewell Fill Valve - 3/4" and 1-1/8"